The TAMS 1800 Series USB Controlled Switches provide a flexible, scalable switching solution for functional test. Switches are available in multiplexer, matrix, and general-purpose configurations. Each switch can be used stand-alone, or they can be combined to build larger and more complex configurations. 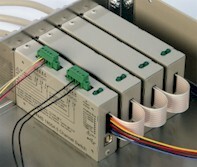 The easiest way to combine switches is via the "Analog Bus", a common set of connections on the rear of each module. These Analog Bus connections can be daisy chained together with simple flex cables or ribbon cables. The Analog Bus contains a 4 wire signal path, Trigger In and Trigger Out, and a Product Under Test Common/Ground. All signal switches contain a Product Under Test Common/Ground design that provides for many ground connections, wide ground planes under all user signals, and complete isolation between the Product Under Test Common/Ground and the PC/USB ground. Software is provided for a Graphical User Interface and a VXIplug&play driver and an IVI Switch Class driver. The switches are USBTMC (Universal Serial Bus, Test and Measurement Class) devices, so they can be directly controlled with SCPI (Standard Commands for Programmable Instruments) commands via a traditional instrument IO library such as SICL or VISA. This allows a user to write test programs in virtually any language or environment, include NI TestStand, NI LabVIEW, NI LabWindows, Agilent VEE, Microsoft VisualBASIC, C, C++, etc. The Graphical User Interface provides interactive control and readback of each device. This is very useful for debugging, since the GUI shows the state of each device even while a user-written test program is controlling the device. 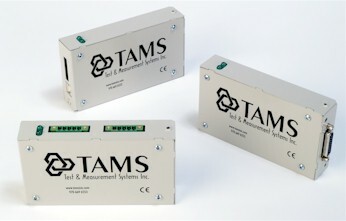 The TAMS 1800 Series Switches connect to a PC through a standard USB cable. Both USB 1.1 and 2.0 are supported. The TAMS 1800 Series Switches operates at USB Full Speed.